Mesa: Layout #JG1 – 2 levels, running on EagleWings Iron Craft modules, featuring 14′ long ‘Hell-Gate’ bridge. Mesa: Layout #RS1 – Layout built on raised 3-foot high “island”. Phoenix: Layout #GS1 – This layout has a 4-track main line (3 largescale tracks and 1 standard gauge) built on Eaglewings Ironcraft modules, and includes a unique Eaglewings Ironcraft rotating bridge section. Phoenix: Layout #KM1 – Whiskey Flats Railroad , 900 feet track, 100 feet long, travels through 5 log tunnels. San Tan Valley: Layout #WS1 — completely fills rear yard. (distant) Dragoon AZ (180 miles southeast of Phoenix): Layout #DC1 — Dragoon Mountain Scenic Railway, dmsry.blogspot.com – Dirk Carmichael’s record-setting, unbelievably huge, G ga outdoor layout-under-construction. 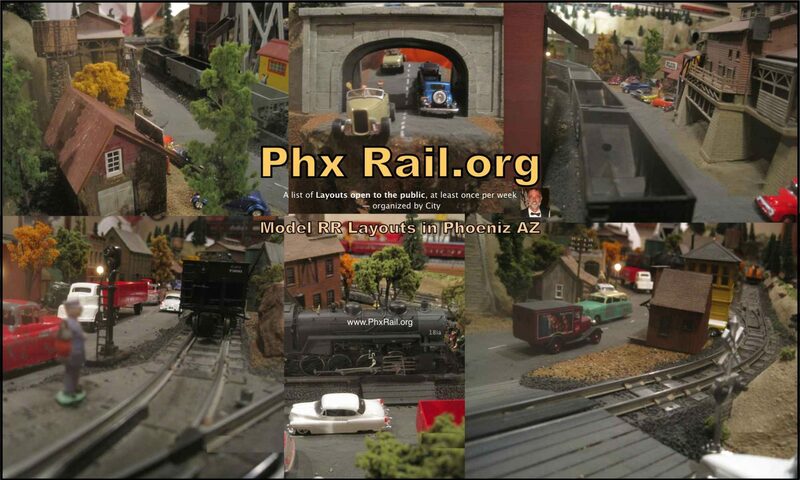 Mesa: Layout #DS1 — Palo Verde and Southwestern Railroad – Dennis Sirrine’s huge outdoor layout, built by the owner of the Rancho De Tia Rosa restaurant. Chandler: Layout #WN1 (since dismantled): Bill N’s “Westerwald Reich Bahn” German-themed layout.